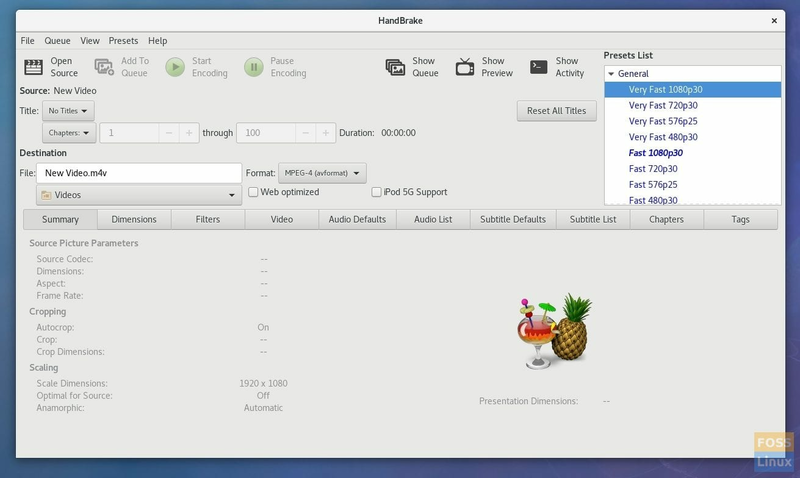 HandBrake is one of the most popular multimedia encoders out there. It is cross-platform, free and open source software available for Linux, Windows, and Mac OS. It has some powerful features which are hard to find even in the paid ones. It can convert any audio/video files you throw at it. Let’s check out steps of installing handbrake in Fedora. There are a couple of limitations as well which HandBrake can’t do. It doesn’t support Pass-through video without conversion, meaning video is always converted. Also, it cannot create Blu-ray, AVCHD, or DVD discs. We will need to enable RPM fusion repository on your Fedora system to be able to install the utility. This installation method should work on Fedora 22 and above. The screenshots below are from Fedora 27. Step 1: Click ‘Activities’ and launch ‘Terminal’. Step 2: Type the following command and hit enter. This will add both free and non-free fusion repository sources to your Fedora installation. Step 3: Pay attention to the terminal and enter ‘y’ when prompted. Step 4: Next you have to log in with superuser rights. Use ‘su’ command followed by your root password. Step 5: Now you can use the dnf command to install HandBrake. Step 6: Enter ‘y’ when prompted in the Terminal. That’s it. HandBrake should be installed. You can launch it from the ‘Activities’ menu. More details of the utility are available on the official page.